In many cities where industrial activity is pushed to the fringe, Blohm + Voss on the Elbe is an iconic sybmol in the port city of Hamburg, a shipyard steeped in tradition but fully modernized to handle some of the most complex and high-value ship repair jobs in the world: a developed, ultramodern infrastructure and 421,000 sq. m. of yard. Blohm & Voss has seen it share of market cycles, and following the current long shipping crisis due to low charter rates, the repair backlog for commercial vessels is slowly starting to dissipate and the refits that were previously deferred are starting to be undertaken through standard dockings, according to a yard spokesperson. With charter rates rising and shipowners facing a bevy of environmental regulations, Blohm + Voss is looking to work surrounding ballast water management system and scrubber installs and upgrades. 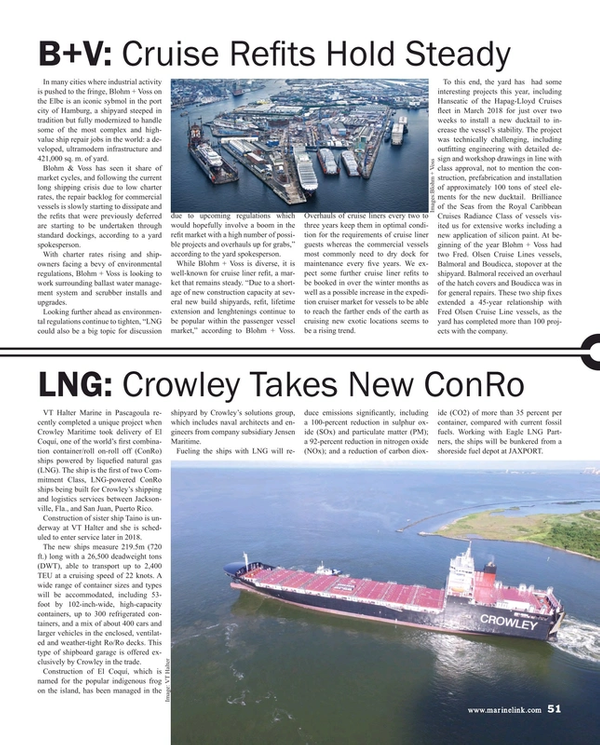 Looking further ahead as environmental regulations continue to tighten, "LNG could also be a big topic for discussion due to upcoming regulations which would hopefully involve a boom in the refit market with a high number of possible projects and overhauls up for grabs," according to the yard spokesperson. While Blohm + Voss is diverse, it is well-known for cruise liner refit, a market that remains steady. "Due to a shortage of new construction capacity at several new build shipyards, refit, lifetime extension and lenghtenings continue to be popular within the passenger vessel market," according to Blohm + Voss. Overhauls of cruise liners every two to three years keep them in optimal condition for the requirements of cruise liner guests whereas the commercial vessels most commonly need to dry dock for maintenance every five years. We expect some further cruise liner refits to be booked in over the winter months as well as a possible increase in the expedition cruiser market for vessels to be able to reach the farther ends of the earth as cruising new exotic locations seems to be a rising trend. To this end, the yard has had some interesting projects this year, including Hanseatic of the Hapag-Lloyd Cruises fleet in March 2018 for just over two weeks to install a new ducktail to increase the vessel's stability. The project was technically challenging, including outfitting engineering with detailed design and workshop drawings in line with class approval, not to mention the construction, prefabrication and installation of approximately 100 tons of steel elements for the new ducktail. Brilliance of the Seas from the Royal Caribbean Cruises Radiance Class of vessels visited us for extensive works including a new application of silicon paint. At beginning of the year Blohm + Voss had two Fred. Olsen Cruise Lines vessels, Balmoral and Boudicca, stopover at the shipyard. Balmoral received an overhaul of the hatch covers and Boudicca was in for general repairs. These two ship fixes extended a 45-year relationship with Fred Olsen Cruise Line vessels, as the yard has completed more than 100 projects with the company.